1. Heat the oven to 400 degrees. Prick each sweet potato with a fork in 5-6 places; place on a baking sheet and bake for 1 hour or until the potatoes are very soft. Remove from the oven and cool slightly. When the potatoes are cool, peel off the skin and remove any dark spots. Cut the potatoes into chunks and puree in a food processor until smooth. Measure out one cup of potato puree; discard the rest or save for another use. 2. Reduce the oven temperature to 350 degrees. Butter and flour the bottoms and sides of three 8- or 9-inch pans, or spray with baking spray. Line the bottom of the pans with parchment paper; grease the paper. In a small bowl, combine the flour, baking powder, cinnamon, nutmeg, and cloves; set aside. 3. In the bowl of electric mixer fitted with the whisk attachment, beat the egg whites on medium speed until frothy. Increase the speed to high and gradually add ¼ cup sugar. Continue to beat until the egg whites are moderately stiff. Transfer the egg whites to a separate bowl. 4. In the same bowl (no need to wash it), with the mixer fitted with the paddle attachment, combine the sweet potato, butter, vanilla, remaining sugar, and salt; beat on medium speed until light and fluffy, 3-4 minutes. Add the egg yolks one at a time, scraping the sides of the bowl after each egg yolk is added. Reduce the mixer speed to low and add one-third of the dry ingredients, followed by half the milk, another one-third of the dry ingredients, the remaining milk, and the remaining dry ingredients. 5. With a large spatula, fold in one-fourth of the egg whites into the batter to lighten it. Fold in the remaining egg whites until no streaks remain, making sure to not over mix. Divide the batter evenly between the prepared pans. 6. Bake for 25-35 minutes or until a toothpick inserted into the center of a cake layer comes out clean. Let the cake layers cool in the pan for 10 minutes, then turn out onto wire racks. Cool completely before frosting, at least 1 hour. 7. For the frosting: In a stand mixer fitted with the paddle attachment (or in a large bowl with a hand mixer), beat the cream cheese and butter on medium speed until smooth, about 1 minute. Stop the mixer, add the sugar, and mix on low speed until the sugar is incorporated; increase the mixer speed to medium and beat until light and smooth, 2-3 minutes. Mix in the maple syrup. 8. 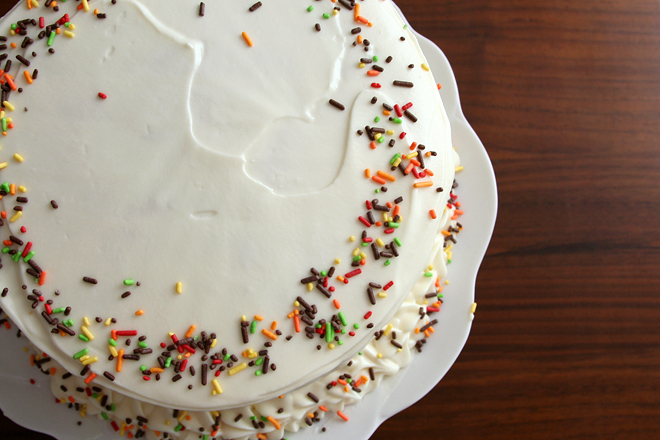 To assemble: Transfer one cake layer to a serving platter. Evenly spread ⅛-inch frosting over the top. Top with a second cake layer and another layer of frosting, then the third cake layer. If you have time, spread a very thin layer of frosting over the top and sides of the cake; chill, uncovered, for 30 minutes; this step will reduce crumbs in your final layer of frosting. Spread the remaining frosting evenly over the top and sides of the cake.